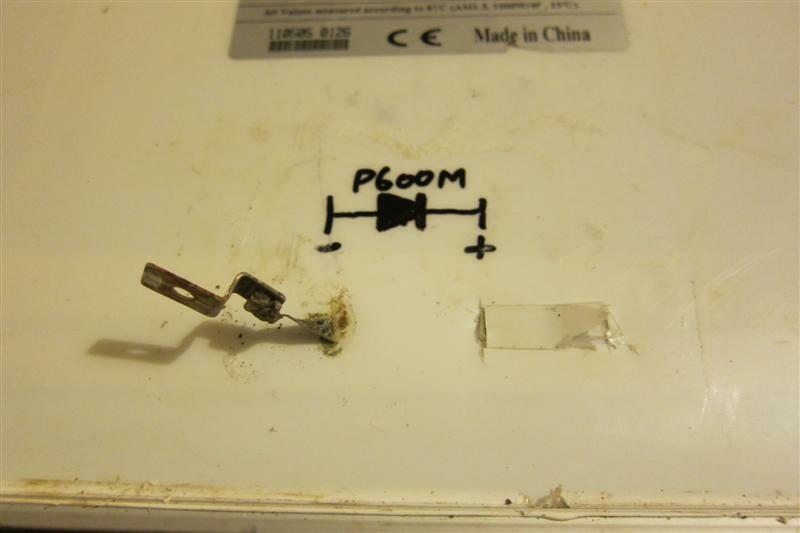 One of my cheap 80 watt solar panels had corroded connections inside it's junction box. Here's how I fixed it. Yesterday I went to connect up two of my 80 watt solar panels to a new micro grid-tie inverter I'd just baught. In preparation for this I'd disconnected the two panels from my charge controller several weeks ago. But when I hooked the panels to the inverter it showed only 19 volts being produced. The two panels are connected in series so it should be showing about twice that. 19 volts is what you'd expect from a single "12 volt" panel (when measuring it without a load). I went up on to the roof to measure the voltage inside the junction boxes on the back of the panels. As soon as I started unscrewing the cover of the first junction box water started pouring out - rusty brown coloured water. The reason I was reading 19 volts coming from the two panels in series is that this one was completely shorted out by the water in the junction box. The other panel was working fine. At this point I should acknowledge that this was a cheap solar panel that didn't come with cable glands on the junction box (to keep the water out). I made the mistake of (a) mounting the panel so that the cables came out of the top of the junction box and (b) "sealing" the cables with blobs of silicon sealant - which didn't keep the water out. So I'd bought cheap and installed badly. Having the junction boxes at the bottom of the panel seemed like a good idea at the time because it resulted in shorter cables. I've now turned all my panels up the other way so that all the cables come out of the bottom of their junction boxes. And I've put real cable glands on that offending junction box. I used a rag to clean out the gunk, then let it dry out. 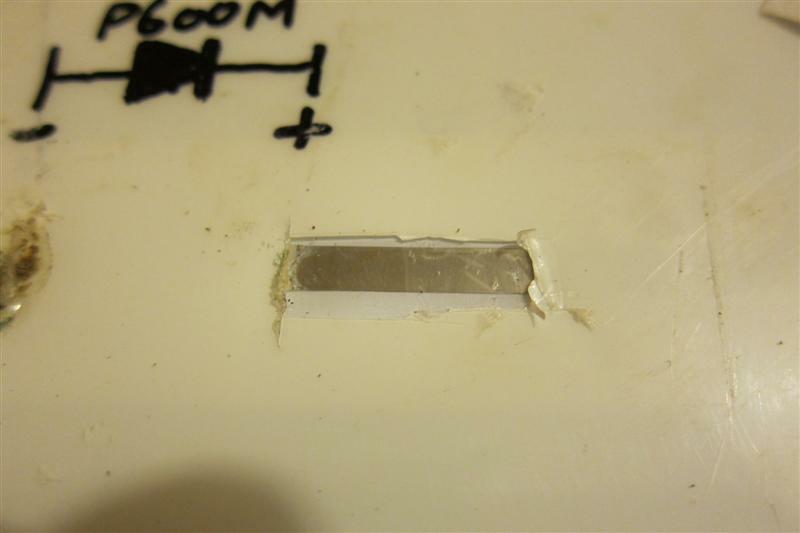 My junction box was glued down with some sort of silicon sealing. I used a sharp serrated kitchen knife and a bread knife. I started at the easiest looking corner and poked the blade in under the junction box - being careful not to cut the plastic backing of the panel. As long as you keep the blade flat against the back of the panel you should be OK.
Clean off all the remaining silicon. I used a citrus based cleaner called De-solve-it. Use a felt pen to write (+) and (-) on the panel so you don't forget. I also drew in the protection diode. 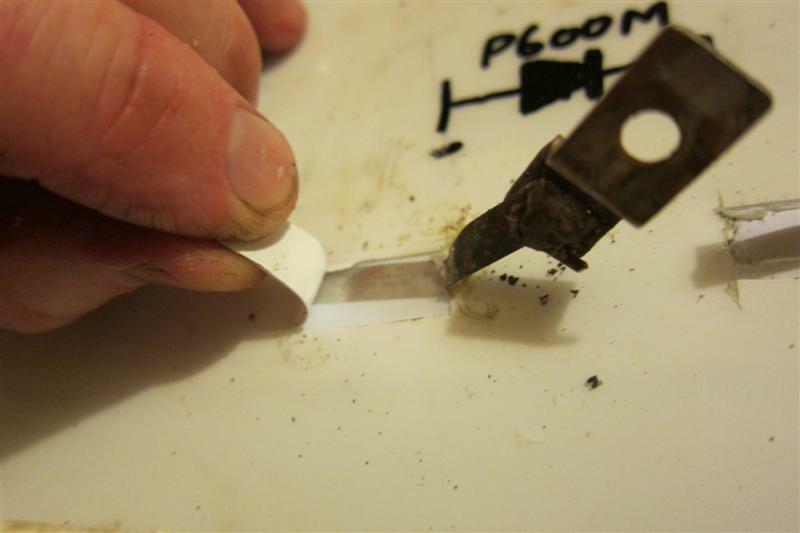 Use a sharp Stanley knife (box cutter) to make two 25mm long cuts through the backing plastic. 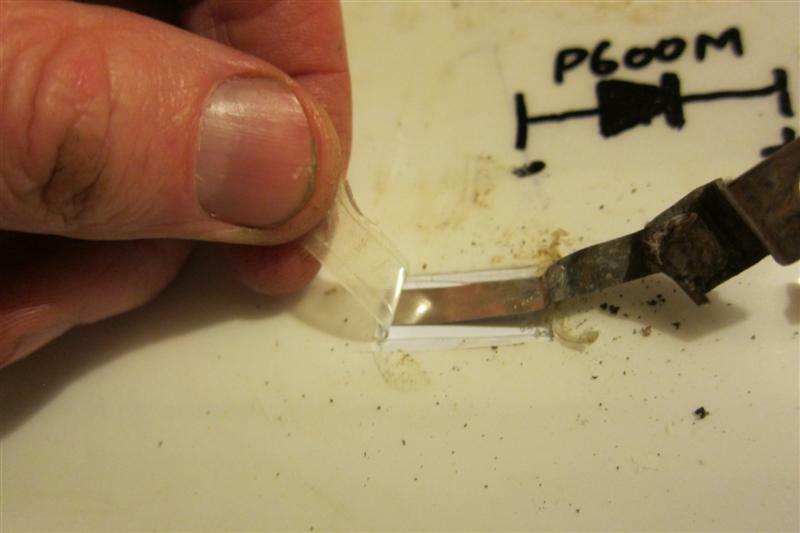 My panel also had a flexible "glue" layer which I also cut through. 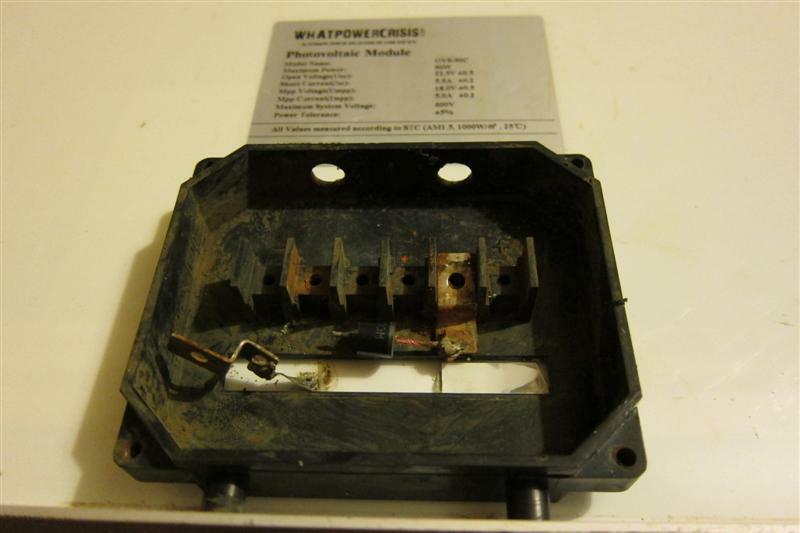 Terminal block [Jaycar HM-3204] - to replace the rusted terminal block in the junction box. I got one with holes big enough to hold my guage 4 power cables. 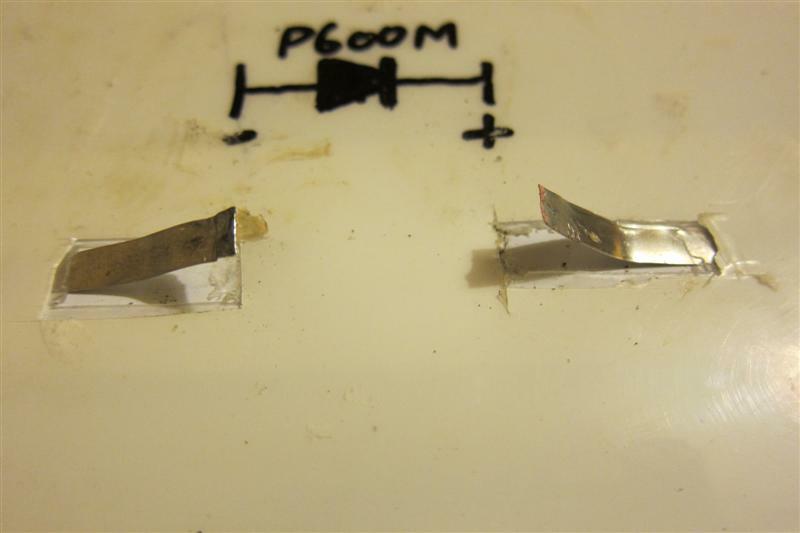 I cut the terminal block to my desired length. 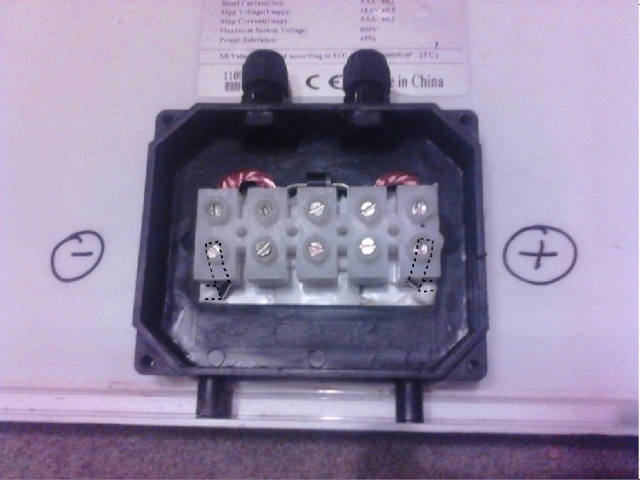 My terminal block was too big to fit inside the junction box so I cut the tops off to reduce it's height. 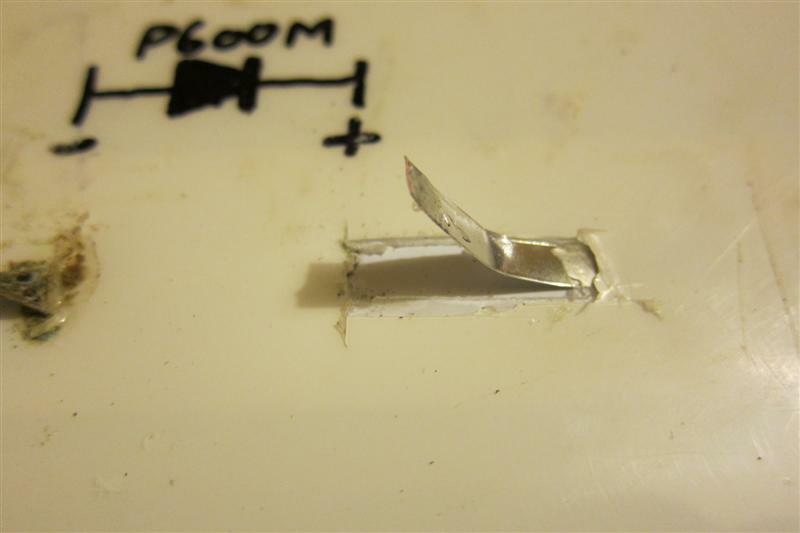 Then I cut/hacked out the old terminal block from the bottom of the junction box. Then I worked out an arrangement that allowed it to all fit inside the box - in my case with the diode on the other side of the block and linking wires. I realised afterwards that the link wires didn't need to be that big. I'll route the power cables around to fit in the same slot at the panel conductors. I used white silicon sealant to glue the terminal block and junction box on to the back of the panel, then left it overnight to dry. The dashed lines show how the metal strips are connect inside the connector block. The next morning I stuck the panel in the sun and measured 19 volts output (no load). Problem solved. I've now mounted it back on the roof and it's happily producing power again.